The New England Morgan Horse Show Committee held a meeting at the Three County Fairgrounds in Northampton, Massachusetts on April 2, 2011. 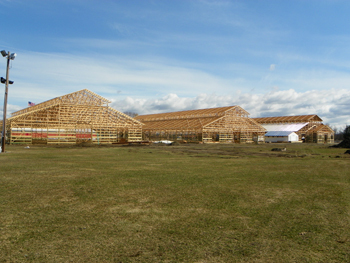 The main purpose for the meeting was to view the construction progress of three new 100-stall horse barns on the fairgrounds and discuss what effects the construction would have on the 2011 show. The Committee is happy to report the barns are completely framed. Roofing and side walling has been started and many of the infrastructure improvements are well underway. We are looking forward to the debut of these great improvements and anticipate the completion date set for June 15th will be easily met. "Our exhibitors this year will experience the many improvements the facility has to offer," stated Fred Nava, Show Manager. Co-chairpersons Debra Lane and Christine Nava reported that many changes and improvements would take place at the show this year. One of these changes is the introduction of a three-judge MOS system. A change in the Hunter Jumper Judge from Mr. Jay Mullin to Mr. Doug Raucher from Easthampton, Massachusetts. Class 212, English Pleasure Junior Exhibitor Championship 13 and Under will show non-numerically following class #169 of the Friday morning session. Western Dressage classes, Basic test 1 & 2 and Primary Test 1& 4 have been added to the show. This year’s fundraiser, dedicated to future show improvements, will be a $15,000 raffle. There are 3 chances to win $5000.00 each for a total of $15,000. Winning tickets will remain in the drawing until the last ticket is drawn. There will be a limit of 500 tickets sold at $100 each. Please contact any committee member for tickets.